Rekindle the Romance at Home! Sweethearts, spouses, and parents Ashley and Gabe Rodriguez found themselves deep into marriage and child-rearing when they realized they were spending most of their evenings staring at their computers. Determined not to let their relationship deteriorate into that of "roommates with children," they institute a weekly date night: they saute, roast, mix and dice and spend time reconnecting over simple but thoughtful dishes like Crostini with Ricotta, Prosciutto, and Peas, Tomato and Fennel Gazpacho with Dungeness Crab, Fennel-Crusted Lamb Chops, and Dulce de Leche and Nectarine Creamsicles (sometimes even with an expertly chilled cocktail). Just carving out time to talk, cook, and eat together became the marriage-booster they needed, and now with Date Night In she invites you to make date night an integral part of your week and shows you how to woo your partner all over again with food, drink, and conversation. 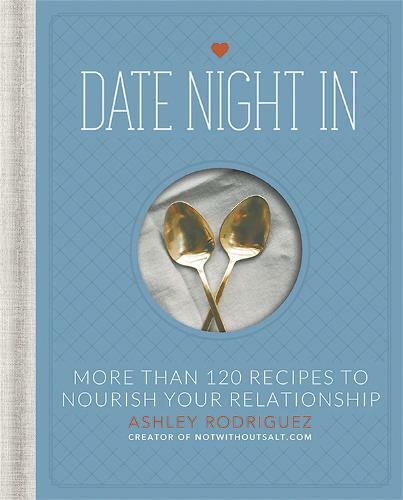 Packed with tantalizing and delicious recipes, Date Night In is a must-have cookbook for any couple who wants to spice things up with special seasonal meals at home with a table for two.